A lot of the facts regarding the ketogenic diet has already been covered in an earlier article retated to the Atkins Diet. In principle, these diets are quite similar, and operate under the same mechanism. It can be said that the Atkins diet is a form of ketogenic diet. Instead, in this section we will look at how the ketogenic diet can be applied to bodybuilding and some things to look out for. A large component of bodybuilding is to have a very lean look, with minimal body fat to show a high degree of muscle definition (looking cut). To do this, it is necessary to shed fat. In theory, a ketogenic diet is quite good at fat catabolism (ie. burning), because the body no longer has access to ample amounts of carbohydrates, so it is forced to shift to burning fat as an energy source. 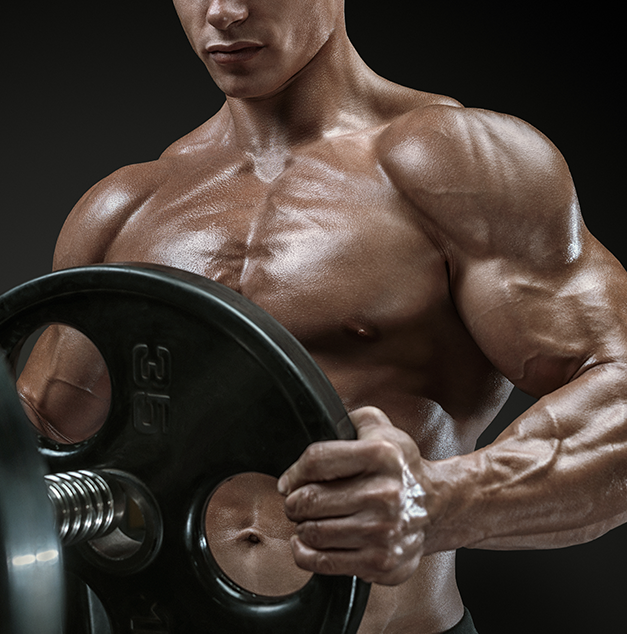 The other large component of bodybuilding is to, of course, gain muscle. This is achievable with multiple sets of high rep weight training. The problem with the ketogenic diet is that because the body is devoid of carbohydrates, and hence glycogen as an energy source, high intensity training may be negatively affected. There are two ways in which it is possible to maintain ketosis while retaining glycogen stores. The first way is through a targeted ketogenic diet (TKD). This is when a meal containing carbohydrates is consumed soon before exercise. Secondly, it is possible to cycle ketosis with high carbohydrate intake through what is called a cyclical ketogenic diet (CKD). For example, during five days of the week, you would be given a low carb allowance (<100g/day), while you will be allowed two unrestricted days (McDonald, 1998). There is no reason to stay on the ketogenic diet indefinitely, as there is no evidence to show that it is more effective in weight loss or shedding fat compared with conventional low fat diets in the long term (Foster et al, 2003). Being a fairly restrictive diet is also not enjoyable for the practitioner and may impair semi-serious/hobby bodybuilders from enjoying food and drink based social functions with friends. However, there are studies to show that weight loss is more rapid in the short term (three to six months) compared to conventional diets (Foster et al, 2003; Yancy et al, 2004). This makes the diet effective for people looking to lose fat in a short period of time, eg. before a competition or show. Furthermore, people are often very result driven individuals, due to the rapid results of ketogenic diets, practitioners are able to gain a psychological edge that may offset any difficulties encountered. These diets are fairly restrictive in what you can and can not eat. Dropping carbohydrates for years on end is not so easy or attractive to many people. However, if this is something you feel is enjoyable or fairly effective for your goals, maintaining this diet in the long term appears to be safe. Ketogenic diets have been used for decades to treat epilepsy in children. For this to be effective, patients live in deep ketosis for up to six years, showing little adverse effects (Hemingway et al, 2001). However, it is important to note that these children may not have the same lifestyle as bodybuilders and athletes, and studies in regards to the safety of the ketogenic diet in the long term, with epilepsy patients, should be taken with a grain of salt.